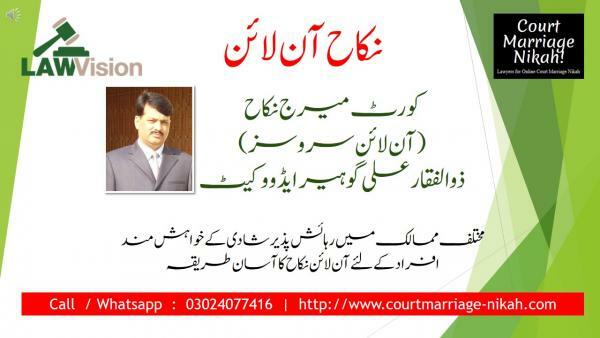 Court Marriage Nikah!nikah Archives - Court Marriage Nikah! As per our Procedure, After Receiving documents we’ll settle a date and time for your Nikah with your Consultation. After Nikah Our Nikah Registrar will Complete Urdu Nikah Namas, which will be completed in all respects including Govt. Seal+Nikah Registrar’s Sign and Seal+Nikah Khawan;s sign+Signatures of witnesses of Nikah. etc. Same time we’ll send you scanned copy of Urdu nikah Nama. After that we will apply for your NADRA Nikah Registration Certificate/ NADRA Nikah Nama. within 2 Days it will be compleleted, its Scanned copy also will be sent to you. After that within further 2 days we’ll got your Nikah Nama Translated from a valid Translater and the same translation will be acceptable worldwide. We’ll send you its scanned copy too. At this time i.e about 4/5 days after Nikah when we will Deposit 3 Nikah Namas i.e URDU+NADRA+Translated Nikah Namas in the ministry of freign affairs, they will return Back to us the same after a weak. At the end we’ll Courier you all the Nikah Namas, after vrecieving them, Both of the Bride and Groom will Sign on it, and will retain them as their valid Nikah documents for ever. Inshallaha. At the end we’ll Courier you all the Nikah Namas, after receiving them, Both of the Bride and Groom will Sign on it, and will retain them as their valid Nikah documents for ever. Inshallaha.